Vacuum range gauges for measuring absolute vacuum or suction pressures which can be permanently installed or used as a test gauge. Use vacuum range gauges to measure pressures which are negative relative to atmospheric pressure. 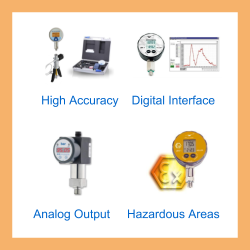 LEX1 (Ei) High Accuracy Digital Pressure Gauge- High precision digital pressure gauge with an accuracy of 0.05% full scale in pressure ranges from 0...30 mbar up to 0...1000 bar. LEO3 Current or Digital Output Pressure Gauge- LCD digital pressure gauge powered externally by a 2 wire series 4-20mA current loop or a digital interface. LEO Record (Ei) Pressure Data Logger- LEO Record combined digital manometer & pressure data logging instrument for recording pressures & temperatures that can store up to 57,000 readings. DS200 Combined Pressure Switch, Gauge and Sensor- Three in one electronic pressure switch, digital pressure gauge and pressure sensor with pressure ranges from 100 mbar up to 600 bar (1.5 to 9000 psi). DM01 Multi-Range High Accuracy Pressure Gauge- High precision digital pressure gauge with 0.05% full scale accuracy, exchangeable pressure range modules from 100 mbar (1.5 psi) up to 400 bar (6000 psi). LEO 2 (Ei) Digital Manometer- LEO 2 battery powered digital manometer with pressure ranges from -1 to 3 bar up to 700 bar with an accuracy of 0.1% full scale with 6 pressure units, zero tare & peak hold display functions and optional ATEX approval for intrinsic safety. DS200P Sanitary Low Range Pressure Gauge, Switch and Sensor- All in one electronic switch, gauge and sensor designed specifically for use in the food, drink and biomedical industry for measuring process pressures. DS210 Combined Low Pressure Switch, Indicator and Sensor- Low range three in one pressure switch, pressure indicator and pressure sensor for use on pneumatics and HVAC applications. LEO1 (Ei) Digital Pressure Gauge- Battery powered digital gauge with an accuracy of 0.1% full scale in pressure ranges from -1 to 3 bar up to 1000 bar. Baroli 02 Precision Digital Pressure Gauge- Precision digital pressure gauge with ranges from 100 mbar (1.5 psi) up to 600 bar (9000 psi) for measuring to an accuracy of 0.125% FS BSL. Baroli 05 Industrial Digital Pressure Gauge- Digital pressure gauge with ranges from 0.6 bar (9 psi) up to 600 bar (9000 psi) gauge or absolute and an accuracy of 0.25% full scale. Baroli 02P Low Range Flush Diaphragm Digital Pressure Gauge- All stainless steel 316L hygienic digital display pressure gauge for measuring low range pressures with ranges from 0-100 mbar up to 0-40 bar. Send us your enquiry for Vacuum, Suction, Negative Pressure Gauges to get assistance with this product type.